No woman has been a Member of Parliament (MP) in Norway longer than Marit Nybakk, who just took part in her 30th and last ceremonial opening of the legislative body. Her tenure also offers a chance to look back on those 30 years, and see how much the country has changed. 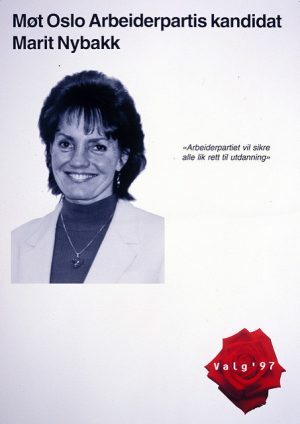 When Nybakk won her first seat as an MP representing the Labour Party in 1986, Norway was also facing tougher economic times and one political issue was the same as now: Debate flew over fuel taxes. As newspaper Aftenposten reported this week, Nybakk wouldn’t have won her own seat in Parliament if the Conservative government at the time hadn’t fallen over the fuel tax conflict. 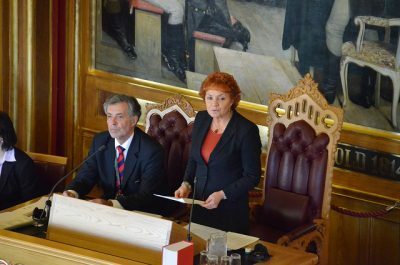 When the Progress Party refused to go along with a fuel tax increase proposed by Kåre Willoch’s Conservatives-led government, Willoch had to resign and Labour’s Gro Harlem Brundtland took over as prime minister. The rest, as they say, is history, but so launched Nybakk’s political career in Parliament (Stortinget), during which she has served under two kings and six prime ministers. She recalled this week how she was scolded by the late Parliament’s president Jo Benkow, because her youngest daughter played jump rope during a visit to her mother’s workplace. Benkow thought that showed an utter lack of respect. “Just think that back then, Norway had among the worst day care offerings in Europe,” Nybakk told Aftenposten, and there wasn’t much tolerance for children brought to work. There were also strict dress codes: Hardly any women wore trousers in Parliament, according to Nybakk. Women made up only 25 percent of MPs at the time, and it took far more of them before late night meetings were mostly abolished and other rules became more family-friendly. ** Children didn’t start school until the age of seven, even though day care was hard to get. ** There was no Oil Fund to help pad the state budget. ** There was no paternity leave and women received 18 weeks, compared to combined parental leave now of more than a year at full pay. ** The state still wholly owned companies like weapons producer Kongsberg, Statoil and the former Televerket, and it could take months to get a telephone line installed. ** There was no self-service at the liquor monopoly Vinmonopolet, there were far fewer outlets and customers had to stand in long lines to request bottles that were stored behind the counter. ** Nearly all stores closed at 5pm, were open just a few hours later on Thursdays and often closed at 1pm on Saturday. It was much more difficult, if not impossible, to go grocery shopping after work. ** There were no security controls to enter Stortinget or other public buildings, nor did airline passengers need to go through airport security on domestic flights. It only took around a 15-minute taxi ride that cost less than NOK 100 to get to Oslo’s main airport at Fornebu. There was only one taxi option in Oslo. ** Nelson Mendela was still in prison, the Soviet Union was Norway’s neighbour and the Berlin Wall was still firmly in place, restricting travel to eastern European countries. ** Hospitals were still owned and operated by local governments, not the state. ** There was only one TV channel in Norway, NRK, which offered no daytime programming. Broadcasting ended around midnight, with NRK playing the national anthem as its sign-off. ** There was no Internet or e-mail and hardly anyone had personal computers at home. There were, however, some large and heavy mobile phones, which were a status symbol for shipbrokers. Nybakk remembers how letters to the editors of local newspapers served as the main channel for public criticism, and how it was a breakthrough to get a fax machine at Parliament. She was part of clearing the way for the establishment of TV2, and extending obligatory schooling to 10 years. Most remarkably, she managed to retain her seat in Parliament with each election. But now, at age 69, she won’t be a candidate for Labour at next year’s parliamentary election. Monday’s opening was her last, and she had her husband Gudbrand Kvaal along as her special guest. Next year they may just watch it on TV.